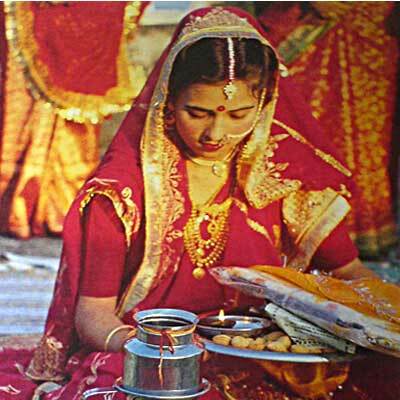 Karva Chauth originated as a social and seasonal festival, but many mythical tales has been added to it later. It is celebrated by the Hindus in north-western India. The idea behind Karva Chauth is very sweet and noble. Earlier, girls sometimes barely teenagers used to get married, go and live with their in-laws in very remote villages. Everyone would be a stranger there for the new bride. In case she had any problems with her husband or in-laws, she would have no one to talk to or seek support from. Her own parents and relatives would be quite far and unreachable. Telephones, buses and trains were not heard of in those days. People had to walk almost a whole day to go from one place to other. Once the girl left her parent's home for in-laws, she might not be back before long. Thus the custom started that, at the time of marriage, when bride would reach her in-laws, she would befriend another woman there who would be her friend (kangan-saheli) or sister (dharam-behn) for life. It would be like god-friends or god-sisters. Their friendship would be sanctified through a small Hindu ceremony right during the marriage. The bride's friend would usually be of the same age (or slightly older), married into the same village (so that she would not go away) and not directly related to her in-laws (so there was no conflict of interest later). Emotionally and psychologically, it would be very healthy and comforting for the bride to have her own 'relative' near her. Once the bride and this woman had become god-friends or god-sisters, they would recognize their relation as such. They would treat each other like real sisters. During any issues later in life, involving even the husband or in-laws, these women would be able to confidently talk or seek help from each other. Moreover, the bride's parents would treat her friend just like their own daughter. Thus Karva Chauth started as a festival to celebrate this special bond of friendship between the brides and their god-friends . The notion of praying and fasting for the husband came much later and is secondary. It was probably added, along with other mythical tales, to enhance the meaning of the festival. In any case, husbands would always be associated with this festival, because the day of starting this friendship between two god-sisters was essentially the day of bride's marriage to him. Hence praying and fasting for him by his wife during a celebration of her relationship with the god-friend would seem quite logical. A few days before Karva Chauth, married women would buy new karvas (spherical clay pots) -- 7"-9" in diameter and 2-3 litres capacity -- and paint them on the outside with beautiful designs. Inside they would put bangles and ribbons, home-made candy and sweets, make-up items, and small clothes. The women would then visit each other on the day of Karva Chauth and exchange these karvas. Season-wise, soon after the harvest, it is an excellent time to usher in the joys of festivities, meet one another and exchange gifts. During Karva Chauth, parents also send gifts (e.g., grains, food items and new clothes) to their married daughters and their children. Grandchildren share a very special bond with their grandparents. Karva Chauth basically is once a year festival to renew and celebrate the relationship between god-friends and god-sisters. Karwa is a festive ritual. It is observed by married women, its aim being the longevity of women's marital life. Observance of the first Karwa by the newly-wed is a special occasion. A newly married woman is given utmost importance by her relatives and immediate family members when she observes the fast for the long life of her husband. She is showered with blessings of blissful married life and loads of Karva Chauth gifts. As this festival is considered very important for married women, all the symbols that reflects the marriage status of a woman is in high demand such as jewelery, bangles, henna, sarees, lehnga choli and many other traditional gifts. Mother-in-law prepares an elaborate Sargi (the pre-dawn Karva Chauth meal) when her daughter-in-law observes her first fast. She wakes up early to prepare a sumptuous and lavish meal inclusive of sweets and other delicacies for daughter-in-law. She blesses her daughter-in-law saying 'Sada Suhagan Raho' which means, 'may you always enjoy a blissful married life' when the latter touches her feet with reverence. She also presents her daughter-in-law with gifts, which may be a piece of jewelry or a saree on the first Karva Chauth. Baya is a gift given to a daughter's mother-in-law on the occasion of Karva Chauth. Mothers of newly wed daughters bring gifts for all her family members. Some utensils are also included in the baya which are to be distributed amongst women who join the newly-wed on her first Karva Chauth Puja.